The giant fleas in the Advantage II for Cats commercial are both repulsive and oddly fascinating; it’s hard to look at them or away from them, perhaps because they’ve acclimated to human life so well. They seem like world-weary couch potatoes, not really trying to make a fuss but just fit in. And so it is when the woman vacuuming approaches the giant flea encamped on her couch, the insect very accommodatingly lifts a hind leg to allow her work to continue. The flea fits in all too well, and is possibly less offensive than other house guests. As Part 1 of the confusing and muddied Rogue Team episode ended, team members Buck, Huck, and Jeff were roughly thrown into a van by the Rogue Team, winding up in Part 2 (S5/Ep2) in an interrogation room in a cabin deep in the woods. Things became surreal when the masked head of a figure became visible through a window in that room, ordering the boys to capture “The Woman of the Woods,” a witch-like figure last encountered in Lee City, VA. In return for doing this, the captor promised to deliver the identity of those who had killed “the Stonish Giant,” a Bigfoot variant. When their captor had left, a boot knife was produced by which the trio freed themselves. Buck threw a chair through the window where their host had appeared and found a decapitated hog’s head on a stake…eww! Reunited with Willy and Wild Bill, the team went to team leader Trapper’ s house, and found it ransacked. In a secure safe was found a note and cell phone video from Trapper, detailing that he was going by invitation to a cabin of the Rogue Team; GPS coordinates were found. Going to this location the team failed to find Trapper, but rammed around the neighboring roads a bit until they found his truck. Also finding blood in the area, police were summoned. With a canine unit brought in, the trail led to another cabin where a bloodied Trapper was found inside. The blood stemmed from a reopened surgical wound rather than foul play. On the walls of the cabin were pictures of the AIMS team illustrating things that they had missed in their investigations. Going back to the cabin where three of them had been held captive (pictured above), the gross hog’s head was examined, and coordinates were found secured in a shotgun casing found in the hog’s mouth; so glad that I wasn’t eating for this segment! The coordinates were to a location in “The Dark Forest,” with team researcher Jeff sharing that he had gone alone to the Dark Forest, but didn’t know how he had arrived there: presumably the “Woman of the Woods ” was influencing Jeff from a prior encounter. And what is to be found in “The Dark Forest?”- – Why, that’s where “The Black Wolf” lives, a creature to be revealed in an upcoming episode called, “Secrets of the Dark Forest.” – – Are you not entertained?! Once again the Destination America channel has spawned a new show on the strange and the unexplained, this one called True Supernatural, a title which in itself may be an oxymoron. The introductory episode I viewed rehashed an artifact from the alleged alien abduction of Barney and Betty Hill in 1961, alternating with a story on an as of yet unidentified “demon wolf.” Rather than running one storyline through to completion, the show spent several minutes on one tale then bounced to the other, going back and forth in this fashion until this viewer at least was annoyed…it’s not like there were any commonalities between the stories being covered! Now many of us are familiar with the classic Betty and Barney Hill abduction tale, and aliens are apparently pretty rough on human clothing, tearing and staining Betty Hill’s blue dress, which was the artifact examined. A pink powder was left on the upper portions of the dress which unfortunately was lost when the victim aired the dress out. The stains remained, however, and persist on the dress to this day. Speculation exists as to whether the stains may harbor alien DNA, but despite testing by six labs, none can identify the powder, extract DNA from the stains, or even reproduce the stains on the dress fabric by human means. This might even suggest that the aliens in question did not even have DNA, at least as we would recognize it. Betty Hill’s poor damaged dress continues to exist in university storage, and if a smart lawyer ever catches up with said aliens, they’re gonna be smacked with major damage claims, not to mention pain and suffering! DNA testing on the Demon Wolf has been delayed due to the fact that two groups are claiming ownership of it, and the courts must decide who to award it to before such work can be performed. With the glacial pace of some court proceedings, I wouldn’t hold my breath waiting for that ruling! On July 30th, 1966 two picnicking couples got their vehicle stuck on Presque Isle in Pennsylvania. One male walked to town to seek a tow truck with the others remaining behind. Those remaining saw a “falling star” as night approached, the object assuming a mushroom-shape as it approached and landed behind a tree line. A park ranger then appeared, and that ranger and the remaining guy went to investigate the UFO. The two girls remaining with the car saw a 7′ humanoid approach, who attacked the car, hitting and denting it. Of course, there was nothing to be seen of the Bigfoot when the ranger and boyfriend returned. The next day, the Air Force, police, and other groups were crawling all over the site, investigating it. The incident supposedly became part of the Project Blue Book reports. In Fayette County, Pennsylvania a woman investigated noises in the vicinity of her porch, finding instead of the critters she expected a large, Bigfoot-type creature with red eyes. She fired a shotgun at it, at which point the creature disappeared in front of her eyes, apparently “beamed up” by its alien overlords. Now if aquatic beasties are more to your preference, we were given the story of the Lake Pepin Monster in Minnesota, “Pepie” for short. A type of sea serpent, “Pepie” reportedly was photographed in 2004, with the photo showing a humped creature with a long neck. The earliest known sightings go back to 1867, with Native American tribes attributing missing members to predation by the monster. In 1983, a water skier fell off of her skis and while in the drink reported seeing a creature twenty to thirty feet long with scales; she has never returned to those waters since. A boat equipped with “fish finder” type radar discerned a moving underwater object about 6′ wide by 35′ long; diver Cory Breault was sent in after it, to be passed by something large underwater which caught him in a vortex from which he barely surfaced, emerging freaked out by the experience. “Pepie” is mundanely thought to be a giant sturgeon or eel, or more imaginatively a plesiosaur…wet and wild stuff! – – Hoo boy! Monsters & Mysteries in America fed us some great stuff in a recent episode (S2/Ep11), even if some of it was a bit hard to swallow. Mellonheads (not to be confused with “My Melancholy Baby” or Coneheads) are strange, mutant creatures sometimes mistaken for children; we all know what little monsters they can be! In what sounds like a great plot for a low-budget horror movie, a diabolical Dr. Crow in depression-era Kirtland, Ohio of the 1930’s performed sinister experiments in which he mutated orphaned children into monsters. After years of abuse, these deformed and tormented children rose up, fought back, and took revenge on the doctor, burning down his mansion. It’s uncertain whether the doctor was killed, or simply escaped to set up practice elsewhere. …then we have the Devil Monkey, who has been sighted in the Appalachian Montains in the 1970’s, specifically in such locations as West Point, Kentucky where Wayman and Marva Morgan were troubled by something five to seven feet tall that killed and mangled their poor Sheltie dog and made noises while ransacking their garbage cans. Further announcing its presence by a bad odor, the Devil Monkey was spotted by Marva Morgan through a window, and was seen to have sharp fangs and claws. In Saltville, Virginia the parents of Scott Boyd encountered a Devil Monkey while in their car, when the creature raked at their windows and left lengthy scratches in rows of three along the sides of the vehicle. Speculations were made that perhaps the creature escaped from a government research facility (like myself), or was mutated by heavy metal pollution in the area. Last but not least in Topeka, Kansas we were brought tales of the Blue Albino Woman, not to be confused with Smurfette or Dr. Manhattan. This entity is rather a witch with long white hair and pale, blue-tinted skin. A former resident of Topeka, the blue one was tormented and buried alive by sadistic local hoodlums, a practice which ticked her off royally and cast her into payback mode. Now she frequents Rochester Cemetery and chases people out, a plague upon the living bent upon settling old scores…sounds like a plan to me! Hundreds of sightings have been reported in the area, among them one by James George, who while a boy taken clothes shopping encountered big blue in a store among the manikins. More recently in 2013, a Jessica Streeter went to said cemetery with her boyfriend, intent on a little amore but instead encountering the blue avenger, who reportedly scratched at them and tried to choke her. The couple managed to escape, and the young lady later used some Irish/gypsy magic to seal and protect her home from intrusion. A local historian speculated that the Blue Albino Woman may just affect those who are looking for her…she vants to be alone! – – Things went to the dogs or at least the canids on a recent episode of Monsters and Mysteries in America. For those partial to werewolves, the first segment presented the Beast of Bray Road, a wolf-like creature seen more than 100 times in Wisconsin since the 1940’s. Incidents involving the beast seemed to peak in the 1980’s, when a Lori Endrizzi encountered an upright creature consuming road kill along a road that she was traveling home; it appeared to be developing interest in the woman as a second course before she managed to get her stalled car started and escape. A later encounter was also profiled that occurred in 2006 when a Steve Krueger was picking up deer carcasses when something rocked his truck and helped itself to both a deer carcass and an ATV ramp in the bed of his pickup! He gunned his truck and also escaped, although the missing ramp later couldn’t be located. A second segment profiled the Dogman, more of a spirit-based creature seen near Holly, Michigan with more than 100 sightings of similar cryptids across the world. A 2005 incident was presented where a repo man was driven off by a man-dog type hybrid which drove him off the property he had entered to reposess a Cadillac. 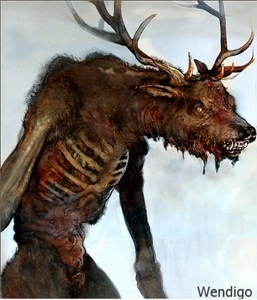 Lastly and perhaps most terrifying were the accounts of the Wendigo, a rather nasty entity with a taste for human flesh rooted in North American legends and said to frequent the North Woods of the Great Lakes region. The Wendigo takes over people like an infection, possessing them with a cannibalistic hunger so intense that the creature is said to chew off its own lips and gnaw on its fingers. A case was presented where a Cree Indian in the 1870’s had killed and eaten his own family, claiming at his own hanging that he was no longer a man but rather possessed by a Wendigo. In a modern case from 2008, a border on a Greyhound bus attacked a fellow traveler, decapitated him, paraded around the bus with his victim’s head like a trophy, and supposedly ate pieces of flesh from his victim…again supposedly possessed by the Wendigo, which in its true form appears as a frozen, cadaverous monster…truly scary stuff! – – It’s not easy to come up with an hour’s worth of strangeness to feed an audience every week, but Monsters & Mysteries in America tries its best to give us a steady diet of it. Three segments of a recent episode occurred in or near the Bridgewater Triangle in Massachusetts, where apparently trolls don’t just frequent the internet, but may also be found trying to lure people into the forest. The Pukwudgie is described as being a three to four foot high creature capable of speech who can’t attack intended victims directly, but tries to entice them to follow to some foul and unimaginable fate. Cases presented involving the Pukwudgie included a 1995 encounter when a man and his dog heard a creature supposedly say “We want you,” and a 2008 event when a video camera is said to have captured an image of one at the edge of the forest. A second segment “Alien Brood” centered on twin sisters who reported being repeatedly abducted by aliens as children with successive abductions occurring into their adulthood. When children, the sisters contended that they were visited by aliens at night who paralyzed and levitated them and took them into a spacecraft, with injuries found by the sisters on their bodies the next day. As adults, the sisters reportedly were subjected to alien “reproductive procedures” and turned into “breeders” for the production of alien “gray”-human hybrids. One 2007 encounter was termed especially violent, and one sister reported meeting a hybrid child during a later abduction.